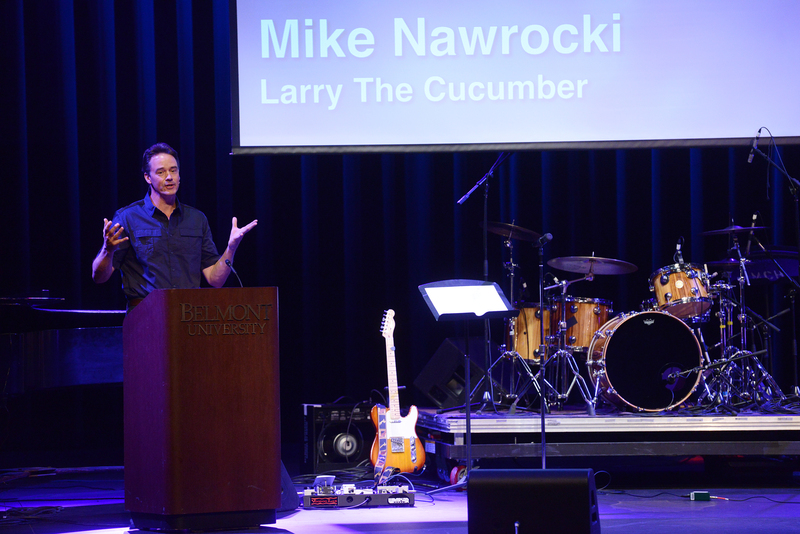 Like every other episode, Nawrocki opened his talk with an “opening countertop” by showing a clip of Larry and Bob the Tomato sitting on a kitchen counter introducing the theme of the episode— in this case, “sharing.” He began sharing his memories of the passion he found at a young age for writing, performing and making people laugh. Nawrocki joined the children’s ministry at his church at 13 by putting on puppet shows about religious figures for the kids. He continued his puppet ministry again once he started college and ended up meeting and working with Phil Vischer, who later became the co-creator of “VeggieTales” and the voice of Larry’s sidekick, Bob. Nawrocki joked about how he and Vischer were “puppet rebels” and the way their ministry was viewed by their college peers. “It’s the opposite of joining the football team in terms of meeting girls,” Nawrocki laughed. After a short break in the talk for the infamous “Silly Songs with Larry,” he shared how he always thought God’s plan for him was to become a missionary doctor. He studied biology in college and planned to join the Peace Corps before realizing that God was trying to lead him down the path of children’s ministry that he’d been following all along. Nawrocki and Vischer began releasing “VeggieTales” episodes in 1993. The series is having its 23rd anniversary this year and is continuing to reshape itself for more releases. The show recently signed a deal with Netflix and plans to release 121 new episodes for the binge-watching pleasure of viewers all over the world.